I grew up in a town with a large Hasidic community. We lived side by side, yet I knew very little about their world. Kept separate from secular schools and interactions, the insular culture was a mystery; so when I heard about “Unorthodox” by Deborah Feldman, I had to read it. The memoir chronicles the author’s life from childhood through a rocky marriage, the birth of a child, and her eventual separation from her community. Not unlike the Amish, or other conservatively devout cultures, the Hasidic world that Deborah experienced kept its practices close to the vest, regulated childhood education, and used the fear of God as a means to promote devotion. While this book merely reflects one woman’s experience and not that of an entire community, it opens the door to a world that many outsiders know little about. For example, Feldman describes how female education is relegated to prayer and a few hours of secular studies. At a recent in person appearance I attended, she noted that her teachers told her and her classmates not to absorb any of the secular education that was mandated.The thought process was that women need to be focused on bearing children and running a household and anything that distracts from these tasks were unnecessary disruptions. In a world where your life revolves around men and children, is there really time for such things as deconstructing the meaning of a Jane Austen novel or learning about the basic anatomy of a human being? Deborah Feldman would probably say, there has to be. Feldman sought sanctuary at the New York Public Library. Teaching herself English and learning about worlds a hundred years apart from her own, but somewhat culturally similar. In these books, Feldman saw herself in the present and who she could be in the future. She saw a world full of possibility and did not let herself settle for her pre-determined path. Feldman’s memoir tells the courageous story of her journey to find herself against all odds, to fight for the life she believed in, and to make peace with her decisions along the way. The book closes at the commencement of her new life, which left me with many questions about how she moved forward in such a bold manner. 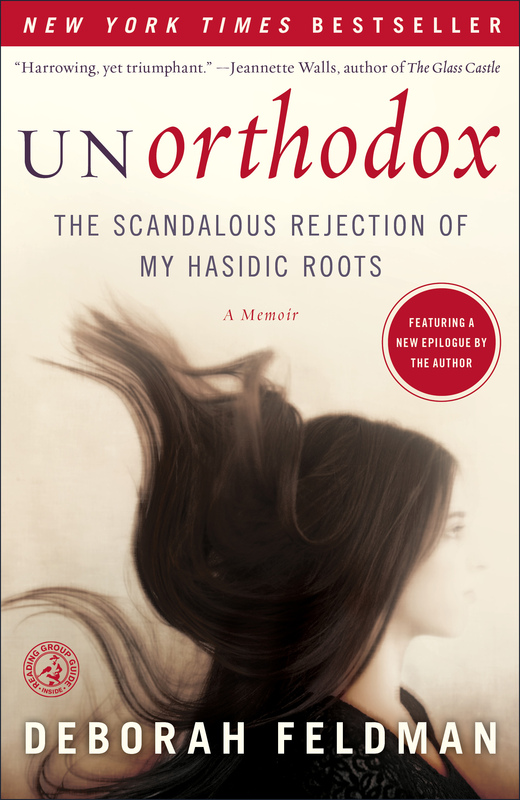 Doing some research on the author, I was pleasantly surprised to find out that she is currently working on a follow-up memoir that relays her more recent experiences of assimilation to non-Hasidic society. Stay tuned! This entry was posted in books and tagged books, deborah feldman, unorthodox.